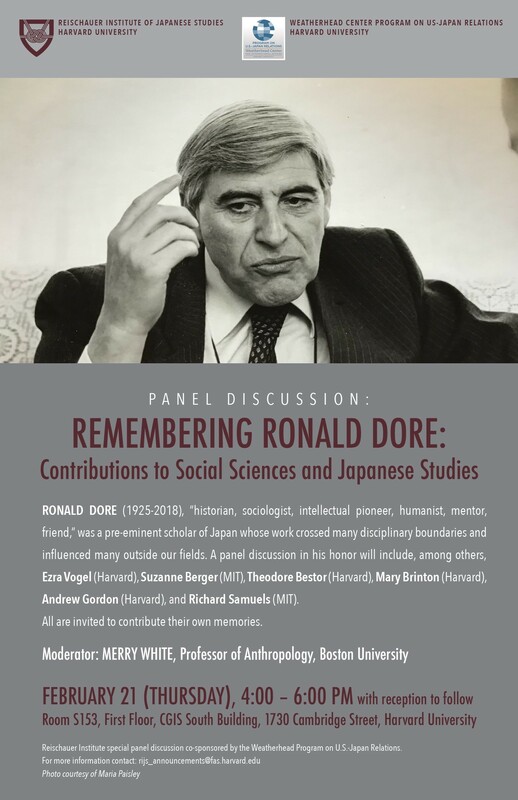 Ronald Dore (1925-2018), "historian, sociologist, intellectual pioneer, humanist, mentor, friend," was a pre-eminent scholar of Japan whose work crossed many disciplinary boundaries and influenced many outside our fields. A panel discussion in his honor will include, among others, Ezra Vogel (Harvard), Suzanne Berger (MIT), Theodore Bestor (Harvard), Mary Brinton (Harvard), Andrew Gordon (Harvard), and Richard Samuels (MIT). All are invited to contribute their own memories. Reception to follow. Insider Out: Foreign-Born Women's Labor Force Participation in Japan, Sweden, and the U.S.